heliosolaire offers you the complete range of KYOCERA solar panels. Solar pioneer with 40 years of experience KYOCERA solar modules are the result of constant research and innovation that allowed KYOCERA to offer very high yield photovoltaic modules. All Kyocera’s photovoltaic modules are designed by Kyocera ensuring all the manufacturing steps Kyocera solar panels are of high quality and achieve efficiencies of more than 16%, tempered glass provides protection against extreme weather conditions, and black frames anodized protects the photovoltaic modules from corrosion over a long period. The power of Kyocera’s polycrystalline photovoltaic panels ranges from 135 Wp to 320 Wp. The panels are designed for both network-connected and grid applications. . The Kyocera solar panel is an assurance of quality and longevity for your solar photovoltaic power plant project, besides the manufacturer Kyocera offers guarantees of 25 years of linear performance on these products. Kyocera photovoltaic modules are offered by heliosolaire at competitive prices thanks to our office in Asia we can supply your solar power plant project from the manufacturer directly avoiding any intermediate costs, contact us for more information. 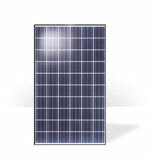 Kyocera-Y-series.pdf Kyocera photovoltaic modules are quality products with high performance at competitive prices. Suitable for all types of solar projects with an investment vision over the long term, Kyocera solar panels are products for demanding customers. Anodized black, the Kyocera solar modules of the Y series are available on a power range of 195 to 320 Kwp with power outputs of 16%. 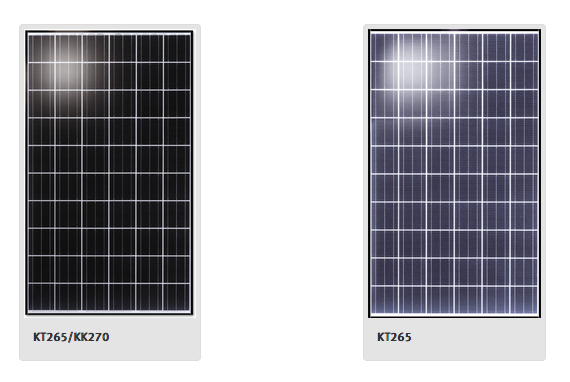 KT260-6GC-A-EN-1.pdf Kyocera photovoltaic modules are quality products with high performance at competitive prices. Suitable for all types of solar projects with an investment vision over the long term, Kyocera solar panels from the KT series are products for demanding customers. Anodized black, Kyocera solar modules are available on a power range of 260 and 265 Kwc with power outputs of 16%. KK270P-3CD8CG_January-2017_EN3.pdf Kyocera photovoltaic modules are quality products with high performance at competitive prices. Suitable for all types of solar projects with an investment vision over the long term, Kyocera solar panels from the KT series are products for demanding customers. Anodized black, Kyocera solar modules are available on a power range of 260 and 265 Kwc with power outputs of 16%. Download TUV certificate IEC-61215ed.2.pdf Technischer Überwachungs-Verein, which is a German control and standardization body. Download ISO 14001 certificate ISO14001-kyocera.pdf ISO 14001 defines a series of requirements specific to the implementation of an environmental management system within an organization, whatever its size and field of activity. The conformity of the apparatus described below with the safety and health standards laid down in the relevant EU Directives is certified by this certificate, both for design, construction and for marketed embodiments.